I left home at 4:30 AM and drove up to find the trailhead which is at the end of Ferncroft Rd in the town of Wonalancet, NH. Unfortunately, the map I got from the Internet showed Ferncroft Rd a bit east of where it was really located, so I passed it up and had to turn around. Once I found it, I drove down to the parking area which was next to a field and farmhouse. A trail sign pointed the way. The weather was sunny, with temperatures in the 60s. The trail followed the parking lot access lane past a field back to Ferncroft Rd, then turned right to follow Ferncroft Rd past the farmhouse and to a small bridge called Squirrel Bridge. I could see Mt Whiteface in the distance, but I couldn’t see Mt Passaconaway. 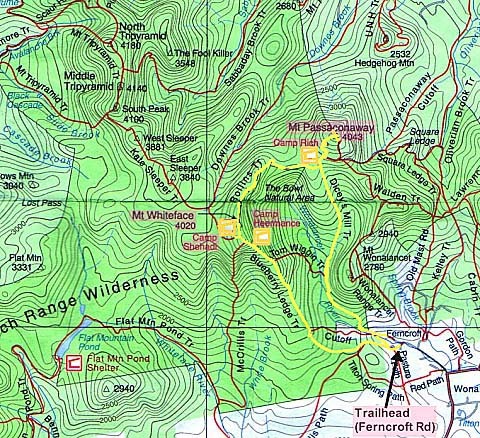 It was hidden behind the closer and much smaller Mt Wonalancet which loomed directly in back of the farmhouse. After crossing Squirrel Bridge over the Wonalancet River, the trail followed a dirt road past several other houses, then turned off into the woods and became narrower. It rose gently, angling away from the river. Soon, spruce and hemlock became more numerous and fragrant, which I thought was unusual at this low elevation (about 1600 ft). The trail continued to climb easily, and was very pleasant, especially with the strong evergreen smell. After awhile, I came to the lower ledges. Although they didn’t require any difficult climbing, they were wide spaces of exposed bedrock that would have been extremely slippery if wet. 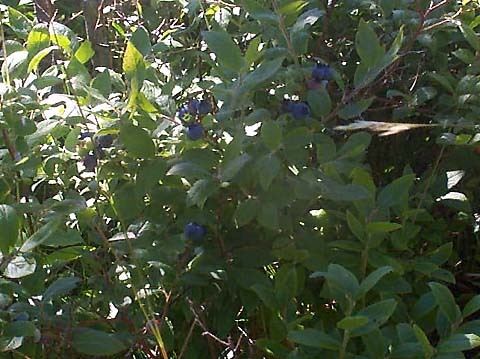 All around, in small patches scattered among the rocks, were lots of blueberry bushes. 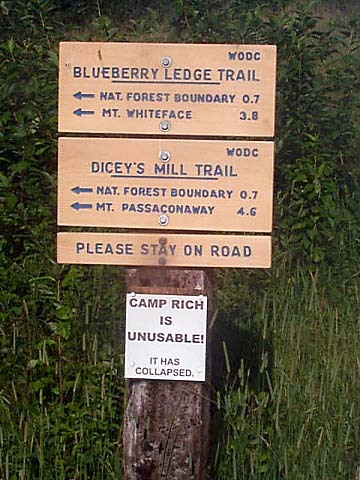 Blueberry Ledge and Dicey’s Mill Trailhead sign. This was a most different trailhead; instead of beginning in the woods, it was located next to a pasture and farmhouse. 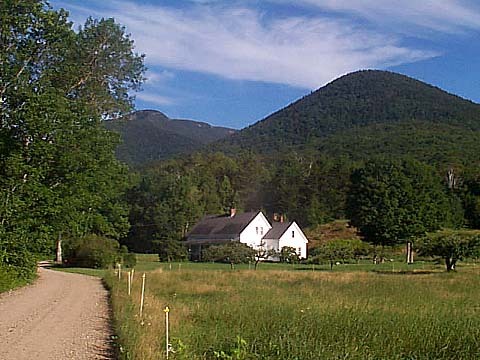 Mt Whiteface (at left) and Mt Wonalancet (at right) from Ferncroft Rd near the parking area. Mt Passaconaway is not visible in this picture. Blueberries. As you might suspect by its name, there were lots of blueberry bushes growing among the rocks on the open ledges on the lower part of the Blueberry Ledge Trail.